We will introduce to you the highlights of Tohoshinki Yunho’s first starring drama “No Limit ~Heading to the Ground~”, including Yunho’s interview! The program will be broadcasted in BS Japan in October! Tohoshinki’s Yunho has completed his debut TV drama [No Limit~Heading to the Ground~]. The activities to commemorate the DVD release of this project started off on 26 June, in Tokyo. After such a long break, Yunho once again showed his energetic self to the fans and accepted many media interviews. This work revolves around the talent, yet unlucky, soccer player Cha Bong Gun; a youthful romance-comedy about his continuous growth. As a member of Tohoshinki, up until now, Yunho, who has driven girls around Asia crazy with their many songs and performances, gave his all to this project from summer last year. Yunho acted as the passionate lead, Cha Bong Gun. Yunho was Bong Gun and Bong Gun was Yunho. Now, Yunho will be making his debut appearance as a musical actor in the musical “Goong”, which begins in September this year. Yunho’s first TV drama [No Limit~Heading to the Ground~DVD BOX I & II] is now on sale and the OST will hit the stands on 25 August. ***No Info whether the drama will be subbed or dubbed. This broadcast concentrates on the drama “Heading to the Ground,” where TVXQ’s Yunho (U-Know) took his first leading role as Jung Yunho. 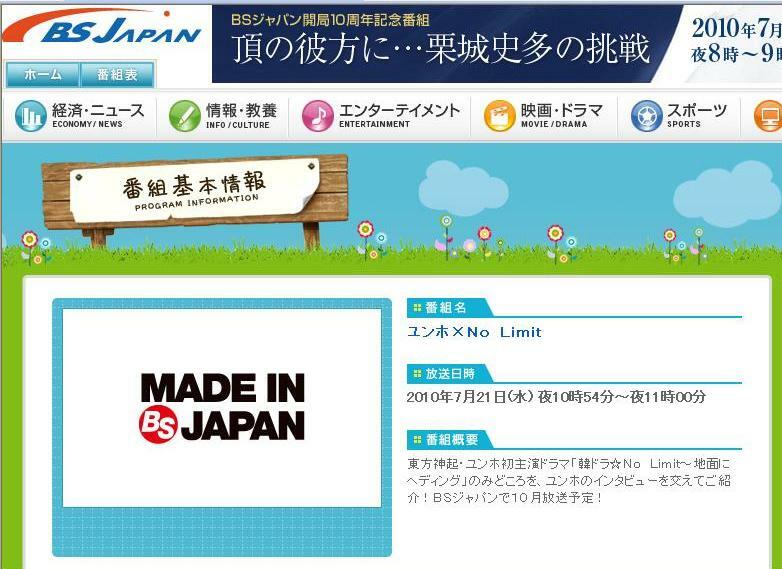 It will start on Sunday the 24th under the Japanese title “No Limit” and comes, of course, with unabbreviated subtitles. It will be aired at 9:45 PM on KNTV. On the website of the TV program, three trailers and a special section containing eight questions and answers are published. Cha Bong Gun, who is portrayed by Yunho, is a young man who has been struggling since his childhood to continue playing soccer, and has become a member of a nameless soccer team. Keeping his outstanding talent a secret through positioning and powerful kicks, is the problem of the character. Becoming too explosive or hot-headed in many things always causes problems. On top of that, getting kicked out of his team leaves Bong Gun in a desperate situation. Here appears the soccer agent, Hae Bin. Hiding that she is the daughter of the owner of a professional baseball team, she has the strong intention to grow as a soccer agent. During the corporate team’s match, she is captivated by the volley shoot of an unknown player (Bong Gun). How will the romance between the self-confident Cha Bong Gun and Kang Hae Bin develop? This time, the one who will be playing Yunho’s love interest is Ara, an actress who won the grand prize during an audition by SM in 2003. In 2006, she has also been chosen as the “Cinderella Girl” out of 40,000 participants during an actress audition by Kadokawa Haruki and Avex. Because TVXQ is still in an unsolved dispute with their agency, their participation in events has been decreasing rapidly. Airing Yunho’s drama in a time like this, it seems that the fans excited voices can be heard everywhere. Actress Lee Yoonji expresses her gratitude to fans. Lee Yoonjii, continuing after last November’s Wednesday and Thursday broadcast of “Heading to the Ground,” this year in January she appeared in MBC’s “Roses and Dandelions”. Lee Yoonjii, her gratitute regarding to the director of her previous drama “Heading to the Ground” that has send her congratulatory words. Also, Lee Yoonji said she has also received encourage words from DBSK leader Yunho, she says, Yunho had said “No matter what, her drama will succeed this time.” When she finished saying this, she smiles brightly. Lee Yoonji expressed, like Yunho, many other actors/crew of “Heading to the Ground” still kept in contact through SMS, phone, just like when they were filming together. Aside from the rating, everything else was wonderful. Especially when seeing Yunho’s serious attitude towards that drama, since it was Yunho’s debut drama, Yunho was a very open hearted person, that naturally got close to everyone. Regarding the rating, even though its a pity, but everything ended well, on the whole, her feelings were good. Also, Lee Yoonji expressed that the fans were very understanding to her, either when she was filming with Kangin for “We Got Married” or filming with Yunho for “Heading to the Ground”, fans were very nice to her, she was relieved. She said this with a smile. Especially in “Heading to the Ground”, there was a scene where I had to give Yunho CPR, I actually heard fans saying things like “take care of him”. She was referring to this scene… I understand perfectly well that this was acting… but the jealousy is still there! !